We got our hands on the latest games in the Pokemon Saga - the Black & White version. We weren't totally impressed on the game wholly but did surprised us with its new features. Read our chief editor's review on the game. 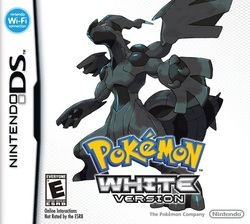 I got my hands on the latest game in the Pokemon series, the Pokemon white version recently. I couldn't afford to buy a black version not because I didn't had the money to buy it but the stock was out and I have to wait 2 days to get it. So, by the time I played this thrilling and one of the best in the series game. First, I need to tell you all that I'm a huge fan of Pokemon. Not only because of the fact that it was the first cartoon I saw in my life, but the storyline is amazing and the saga still is continuing (Black and White have not yet appeared on the TV but it'll come pretty soon). I also played the previous ones like Gold and Silver for GameBoy and Diamond, Pearl, Platinum, HeartGold and SoulSilver for DS. Black and White takes place on a new region called the Unova (New York based) and not the previous ones. Black and White has the same storyline if I'm correct. Pokemon Black and White have major differences compared to the previous ones in the available pokemons. If you are playing Black, you can get pokemons like vullaby, cottonee, gothitelle and more. The legendary fire Pokemon Reshiram can only be obtained in Black Version. On the other hand, you'll encounter petlil, lilligant, solosis and more. The legendary electric pokemon Zekrom can be obtained in White version. So, if you want to get Reshiram, you need to have Black version and Zekrom vice-versa. I prefer white because Zekrom is more powerful and stylish and have immense electric power. Both look beautiful but Zekrom has a little advantage. So many new pokemons are available but I guess most of them are not good and taken from shape of lamps, candles, trash etc. But the story was very stunning in the last. The PokeCenter and Peke Mart are now combined so you can shop and heal at one place. Another cool thing is that TMs can now be used as many times you want and the moves can be erased easily. There are two new battle modes. Trio battles which you play with three pokemons and rotational battles. Another exciting feature is the seasons. Seasons change in the game and seasons also depend on the availability of a particular pokemon and also, their appearences. Entralink is a new feature which allows other players to visit you in-game. There is also Dream World from where you can get new pokemon and items. Also, now you can play battle with random opponents without a friend code. The Pokemon Contest is replaced with Pokemon Musicals which is not competitive at all and is an absurd feature. You can play as a boy or a girl. While starting, Professor Juniper (She is the Prof. in this game) will give you three powerful pokemons to choose from (Snivy-Grass, Tepig-Fire and Oshawott-Water). Then your journey begins. You'll also be accompanied by your two new friends-Cheren and Bianca. The Gym Leaders are pretty strong but I don't know why, I kind of felt the game was easier than the previous ones. The stunning features are the new battle cam and enhanced 3D. Almost all the structures are 3D. There is C-Gear which allows you to connect via IR, WiFi or Wireless Connections. The game has amazing graphics and a variety of regions you can visit. The journey seems easy for me. And the arch enemies in the game are Team Plasma. Team Plasma is on the move with a new idea – Pokemon Liberation. You'll be fighting with them in several places of your journey and helping the people. You'll also meet their leader N (very strange name). The stunning fact of the game was N capturing Reshiram. I used my character and fought all the way to the top of some dragon tower and when I reached there, what surprised me was the fact that N captured Reshiram. Then he'll ask you to go to the Relic castle to get the Dark Stone containing Zekrom but you won't get it. But soon after, you'll get the stone from the museum where you went before. Next you need to go to the league, beat the Elite 4 as usual and then you can see N defeating the Champion. In the final battle between N and you, Zekrom will appear and you'll have an easy victory. I know it sounds a little not understanding but I recommend you to play this game if you are really a pokemon fan. Also, you'll have several side quests after defeating N (Haven't completed them yet). There were many drawback for the game. It had only one region. In HG/SS, you can go to Jhoto and Kanto. But you can only cruise through Unova. I also expected some more features but overall, the game is surprisingly good with a thrilling storyline. The Musicals is absurd and the main gameplay seems short. So, summarizing every key points I noted. These are the basic advantages and disadvantages of the game. Although it didn't had a long journey, the game did impress me and I'm giving it a score of 9.0/10 . The players are teenage I guess. I always wonder why Ash in the Pokemon TV series has not grown up yet. New battle modes but not much impressive. Graphics are awesome with more battle animations and a better battle cam. Almost all looks 3D. Powerful and pretty nice legends-Zekrom and Reshiram. New features - EntraLink and Dreamworld. Play battles with random opponents without friend code. Seasons change during the gameplay changing the appearence of some pokemon and their availability. PokeMart and PokeCenter are combined and TMs can be used more than once. You cannot visit other regions. Unova is the only place. Gameplay seems too short avoiding the side quests. Not much impressive like the previous ones. Some pokemon are exclusive for Black and White. You need to trade to get them. Most new pokemons are not much impressive. Pokemon musicals is an absurd feature and it is not competitive at all like Pokemon Contests. Randolph Ramsay of GameSpot gets updated on the story for Prototype 2 at GDC 2011. Watch the video. Check out GameSpot@GDC. OMG! Can't believe it? Well you better do because its true. Ken Rosman, studio director announced the sequel to the stunning Prototype game which was a big hit. Watch the official GDC trailer! Check out the website of Prototype 2 for more. Here's a sneak peek video for The Exiled Prince, the day-one PDLC pack available on March 8 along with Dragon Age II. Visit GameSpot@GDC for more. EA is planning to release the next game in the battlefield Series, Battlefield 3. EA presented a trailer at the GDC, Watch it below. More info, visit GameSpot@GDC. The Game Developers Conference 2011 has started on Feb 28th at San Fransisco. The event brings all the major gaming industries and also reveals the upcoming games. The 11th Annual Game Developers Choice Awards and the 13th Annual Independent Games Festival Awards will also be given during the days. The conference will end on 4th March. The Game Developers Conference (GDC) is the world’s largest professionals-only game industry event. GDC 2011 commemorates its 25th edition in 2011 and serves as a testament of how far the industry has come and as a celebration of its bright future. The GDC attracts over 18,000 attendees, and is the primary forum where programmers, artists, producers, game designers, audio professionals, business decision-makers and others involved in the development of interactive games gather to exchange ideas and shape the future of the industry. The GDC is produced by the UBM TechWeb Game Network. This market defining conference features over 400 lectures, panels, tutorials and round-table discussions on a comprehensive selection of game development topics taught by leading industry experts. In addition, the GDC expo showcases all of the most relevant game development tools, platforms and services helping to drive the industry forward. The conference also features the twelfth annual Independent Games Festival, where new, unpublished games compete for the attention of the publishing community, and the tenth annual Game Developers Choice Awards, the premier accolades for peer-recognition in the digital games industry.